…in case you missed it. Posted in News and tagged Frankie Boyle, Obama at 2:28 pm on November 28, 2016 by Broadsheet. i love frankie boyle so much. Ha, ha. Brilliant. Obama, the drone king, giving out about human rights abuses. LOL. Misanthropic, bitter Weegie ‘comic’ who routinely punches down – Katie Price’s son, for pity’s sake – now bosses up against fully functional human being. Bad case of Skibbereen Eagle syndrome there, Frank. Me life on Frankie Boyle. A superb comedian who has suffered much at the hands of the dull and the unimaginative. However, he has more nous and more social conscience in his little body than the entire of our pathetic Government, the Governments of the UK and Europe, and most particularly of the good ol’ USA. Yet gobsh!tes are queuing up to bash President Higgins. This is a horrible world to live in, but people like Frankie sort of give you hope. This is perhaps the most delusional thing I have ever read on the internet. You sir, are a blabbering lunatic. Frankie Boyle is an odious creep who has as much nous as the bar stool in the “bar stool politics” trope. A superb comedian? He just says the things stupid people only say to their mates because they are a little too extreme to say publicly. He has used and abused the legacy of stand-up comedy to justify his shock insult humour that you can hear in the back of classrooms of secondary schools. His recent manifestation as a pseudo-moral compass is possibly his only good joke to date. Yikes – you’re a dab hand at burns yourself, it seems. You are really showing yourself up. Neilo. Very disappointing indeed – grow up. @Starina: to some extent, yes. Sheikh’s a good sort but I delight in finding arcane ways to underscore his imminent senescence. No law against having a vocabulary, is there? I like big words. Marmalade. Fiddle-de-dee. Bigly. Hilarious, Neilo are you really a Neilo and am I really a Sheikh?? Truly, Effendi, this internet is a wonderful thing. Sheikh, I got nothing but love for ya, baby! I enjoy the bit of crack we have. You OK with torture camps run the US Neilo? Michael O’Leary fanboy too I suppose. I despise Frankie Boyle – maybe if he did his disability chunk at Gitmo, it would suffice as torture? I’m no fanboy of anyone but I applaud O’Leary’s no-nonsense stance on industrial relations, restrictions on trade and – oh – his insistence on residing in Ireland and paying his goddamned taxes. And what about Guantanamo neilo? All in favour of the US maintaining a base there. Some of the Ryanair flights I’ve been on have been torture. You really disappoint me, Broadsheet. Moderation because I said ‘gobsh!te”. Savlon or sudocreme is good for minor and major burns, but useless for phosphate based bombing..from a drone..or a billion dollar supersonic jet..
Am I not even being let through at all now. No. I can’t even see this post. 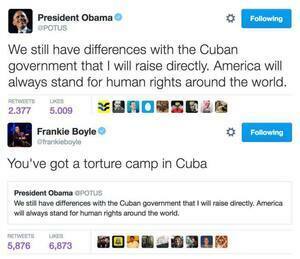 I don’t know what’s more laughable these days, Obama’s efforts at redemption or Frankie Boyle professing to be a moral compass? Obama probably has more credence. Who gives a crap whether Frankie Boyle is a disgusting human being and/or an appalling comedian? Is the point he made the incontrovertable truth? Yes. Just one of the multitudinous ways in which the US gov shows itself to be the most effective terrorist organisation on the planet. Case closed.